For the first DVD release of the „Star Wars“-Saga, Lucasfilm did neither spare costs nor efforts to bring the best possible release to the fans. The original film material, which had already been remastered for the THX release in 1995 and the Special Edition in 1997, was again color-corrected. This wasnt done by LucasFilms but by Lowry Digital, an American-based company specialized in digital film restorations. Lowry Digital also restored the legendary moon landing footage from the „Apollo 11“-mission. Despite immense efforts to present the old saga in the best way possible, not all fans were happy with the DVD release. The DVD edition is based on the special edition, which was released in theaters and on video in 1997 and has been the cause of much debate among fans ever since. Only after massive protests by die-hard Star Wars fans and two years after the first remastered trilogy did Lucas Film decide to also release the original trilogy (the movies without digital effects). However, besides smaller changes, the second release is not anamorph but presented in 4:3, including the obligatory black bars. In order to use the full frame of a 16:9 TV-set, the picture thus has to be zoomed in, which lowers the image quality significantly. Since the two version are cut identically (with the exception of the extended scene), only differences in picture-editing and the audio-track are listed. The conversation between Darth Vader and Imperator Palpatine has been changed and extended. Not only was the old imperator, who in the old version was a mix between an old woman and the eyes of a chimpanzee, replaced with Ian McDiarmid (Palptine in Episode I, II, III und VI), but their dialogue was altered and extended to match the other parts of the saga, especially the prequels. The pink tinge in the long shot of Bespin, (during Luke's arrival) has been color corrected, or rather completely removed. This was done separately and is not part of the general color correction. A continuity error was corrected here and Han's vest color corrected (and not retouched), so that it matches his shirt. Another continuity error. Due to the mirroring of the original shot the emblem on the uniform was also mirror-inverted in the old version. This has been corrected. 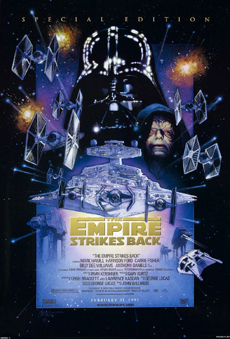 For no apparent reason the DVD-edition omits the first credit to James Earl Jones, which had been inserted in the special edition. For reasons of continuity Boba Fett says something different about Temuera Morrison, since Boba Fett is only a clone of Jango Fett after all. The sound effect of Boba Fett's spaceship Slave I has been adjusted to match the ones from the prequels. When Luke jumps into the abyss a scream was added in the special edition. This scream was taken from an alternative take of the imperator in "Return of the Jedi" but again removed for the DVD-edition.